Having a great cup of coffee is always a good way to start a productive day. At the moment, there are various best cheap coffee makers to consider both within $50 and within $100. It’s worth considering that even on a budget, many people can still enjoy great coffee. Of course, making a great cup of coffee requires great beans but a reliable coffee maker is needed as well. Since coffee makers are used at least once per day, users expect them to work well. While there are many features seen in modern coffee makers, it is important to know that the right temperature, as well as advanced features such as timed delivery, can make a difference. Not all coffee makers are the same, but even the cheap options can mimic some of the features seen in the machines used in coffee shops. Many coffee makers can serve entire families. In this case, one of the most important features to look at is the actual cup capacity. This can mean looking at the water tank’s capacity as well as to the actual coffee compartment. From one to 12 cups in a single go, there are a few designs to consider according to individual needs. The right cup of coffee is always served hot. In many situations, it can actually be cheaper to prepare more coffee at once. But drinking cold coffee doesn’t seem to be too appealing. It is why keeping the coffee hot for a few hours is one of the most important features seen in cheap coffee makers. The temperature is mostly automatic although some of the best machines allow adjustments in Fahrenheit or Celsius degrees. How much time does it actually take to make a few cups of coffee? While the best machines can offer a few cups in minutes, other machines have a complicated process with various filters which need to be replaced after each brewed cup. One of the lasts things people want to do in the morning is to wait extra minutes for the first cup of coffee. The following coffee makers assert their own standards when it comes to everyday functionality and coffee quality. Even with a $50 budget, coffee lovers can find durable products with elegant designs. The following options are known for their flavorful results as well. Why we like it: As one of the few coffee makers with a front-access water reservoir, the coffee maker impresses with its practicality. The design is the main strength of the coffee maker. With a water reservoir with front access, there is no need to move the machine when adding water. In the conditions in which most kitchens today are small, this small design characteristic can save space. It can also simplify the entire process. There are only a few buttons on the Hamilton coffee maker. Brew options can be selected by the user. A programmed time for coffee can also be set. These variables can be tracked on the small front digital display. It is also the display which alerts users when cleaning is needed. With added practicality with its swing-out brew basket, the cheap coffee maker is really easy to use. Many of its alternatives in this price range actually require removing the brew basket altogether. There are a total of 12 cups of coffee which can be made by the machine. Of course, these can be made on the spot or actually programmed. Together with an automatic shut-off function, the machine is as ready as some of its premium alternatives. The intensity of the coffee is in the hands of the user. The number of cups to brew as well as the actual coffee quantity give the user all the power. Of course, this means that the coffee can be different many times. Unlike machines with capsules where coffee is always the same, using a manual brew basket is recommended for a tailored taste. Other advanced functions include a cleaning cycle reminder. This is very similar to what is seen on the machines coffee shops use. This reminder can be effective for those seeking the best coffee. Of course, the machine has a few drawbacks as well. Some users are not familiar with its temperature control. It actually brews coffee at a lower temperature and then heats it up. At the same time, its standard temperature of around 160 degrees Fahrenheit is enough for other users. The good news is that the coffee eventually gets past the 200 degrees mark if needed. With one of the most practical designs in the affordable range, the coffee maker is recommended for small kitchens with reduced countertop space. Why we like it: Suitable for most coffee pods, the machine is recommended for a perfect cup of coffee at a time. 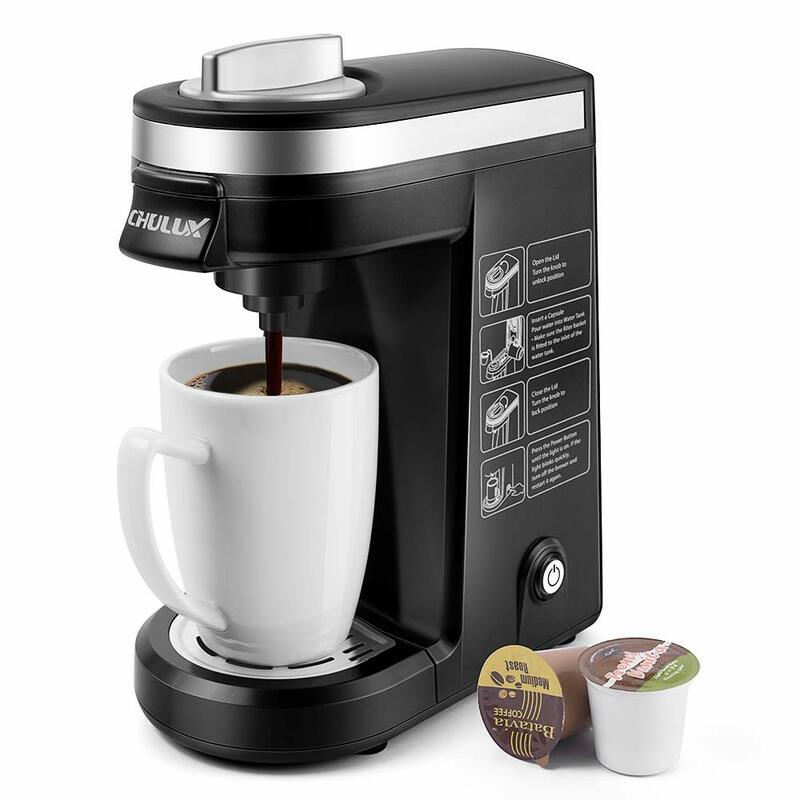 One of the reasons the Chulux coffee maker is a popular choice is based on its practicality. It can be used at the office where it creates to mess or even at home. It is based on coffee pod capsules and it fits most designs on the market. This also means the coffee maker can handle only one cup of coffee at a time. Its controls are minimal. In fact, Chulux made the machine with a one-touch operation strategy. It comes with a 12.7oz water container which is fully heated in about 2 minutes. A lower quantity of water of 3.5oz is fully heated in one minute. One of the premium characteristics derived from the boiling process is actually the cool-touch exterior construction. The coffee maker is still safe to touch even when the water inside is hot. There are many convenient features packed in the compact coffee maker. 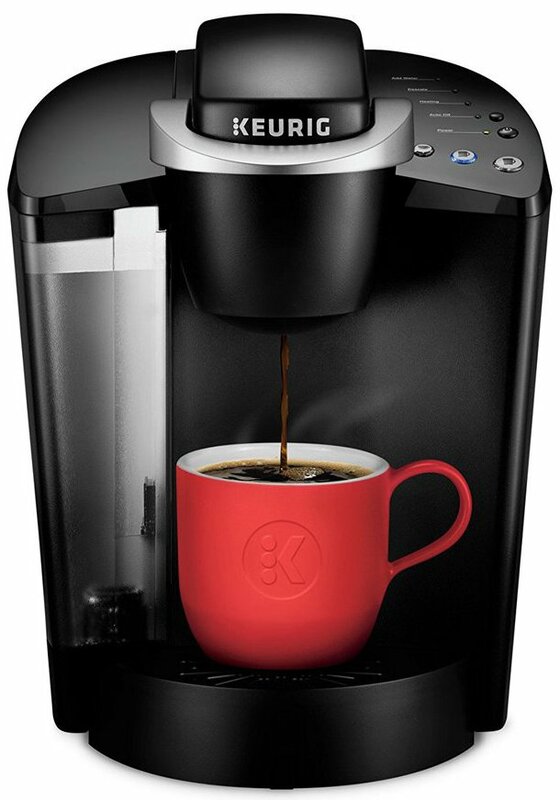 For example, it has an integrated auto shut-off function after each coffee is brewed. This protects the food-grade materials from overheating issues. A removable drip tray has also been added to keep the machine and the space behind it clean. Most importantly, the coffee maker actually does a great job when it comes to ease of use. The steps which need to be followed are simply related to adding enough water and a coffee capsule. With the touch of a single button, the brewing process begins. Based on a 3.5 bar pump, the coffee machine actually delivers solid results and the type of coffee can be changed for better variety as it is not specific to a single brand of pod makers. The machine also comes with a few certifications, even if it is so affordable. It uses BPA-free materials and it comes with UL and FDA certifications for quality assurance. The coffee maker simplifies the brewing process together with cleaning, which sees it as one of the designs for maximum practicality. Why we like it: With a simplicity which even recommends the coffee maker for seniors, the machines are reliable for daily use. Mr. Coffee has been in business since the ’70s. Like many mature businesses, they’ve mastered the art of making their products easy to use. 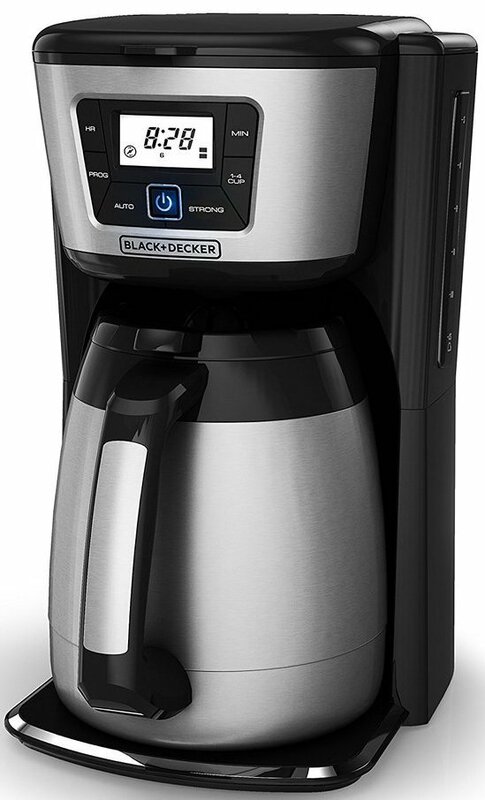 Without too many advanced features, the coffee maker stands out with plenty of simplicity. There are other alternatives, but one-button operation and a filter coffee brewing basket easy to replace is all it takes for great coffee. The design of the brewing basket is easy convenient. It can hold enough coffee for up to 12 cups of delicious black energy. There is a dual water window as well. It is also why the coffee maker can be left in its place without having to move it around every morning. There are no advanced features to expect. However, most users are very satisfied with the on/off button operation. Without having to go through complicated settings, the machine allows users to have hot coffee in minutes. However, one of the few added features allows the machine to pause and the user to grab some coffee before the brewing process is done. The lift & clean filet basket is also easy to use. The filters are not reusable which means keeping the machine clean should not be too complicated either. In a way, Mr. Coffee has created a modern version of the classic coffee maker. Without complicated add-ons which would only drive its price up, it manages to offer a viable solution both for home and for office use. One of the downsides of this minimalistic approach is the lack of programmable brewing. But even in these conditions, many users admit they would not actually consider this feature too much in their daily lives. With a minimalistic approach, the coffee maker is the one-button king for up to 12 cups of coffee at a time. Why we like it: This advanced coffee maker comes with a unique brew strength selector, perfect for different coffee tastes for different family members. Made with a unique black and silver look, the coffee maker looks more expensive than it actually is. Most importantly, it comes with a top performance which means the purchase would not be regretted by most coffee lovers. It has unique design characteristics such as wide-mouth carafe opening. This design characteristic of the carafe is recommended when pouring multiple cups of coffee. The carafe itself comes with a 12-cup capacity. But the entire design of the coffee maker is orientated towards multiple users as it is also easy to clean. The carafe can be washed together with all other dishes around the kitchen. The main features of the machine lay in its programmable functions. 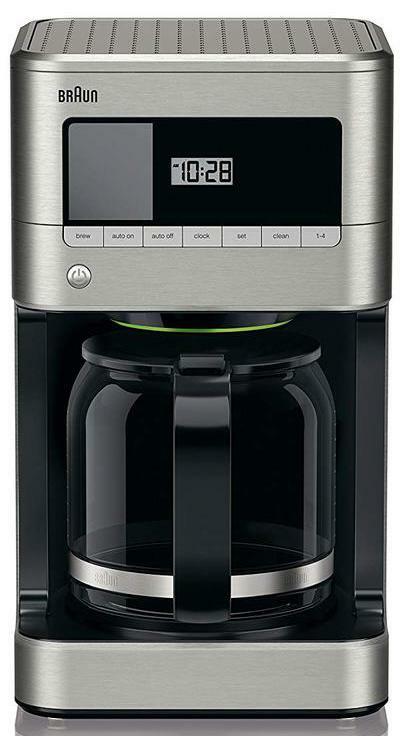 The coffee maker allows users to select a certain brewing time. This function is displayed on a digital screen in the form of a countdown timer. At the same time, the star characteristic comes in the form of the brew strength selector. The machine knows each user prefers different coffee intensities. Another convenient design comes with the even water distribution over the coffee, which results in a richer taste. 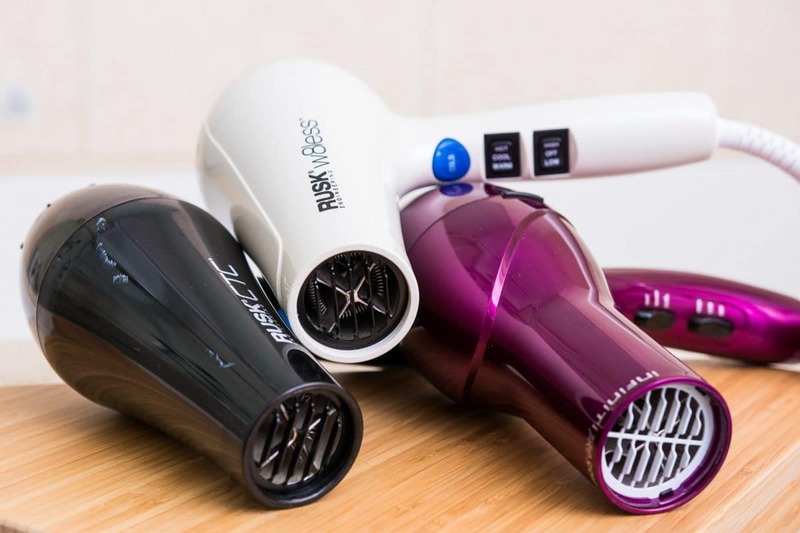 Unlike many other machines which only release water in a single point, Black + Decker made a showerhead-like water release system, responsible for this. Another convenient feature comes with the vacuum-sealed carafe. Its thermal construction means that users can enjoy strong and fresh coffee for up to 12 hours after brewing has finished. 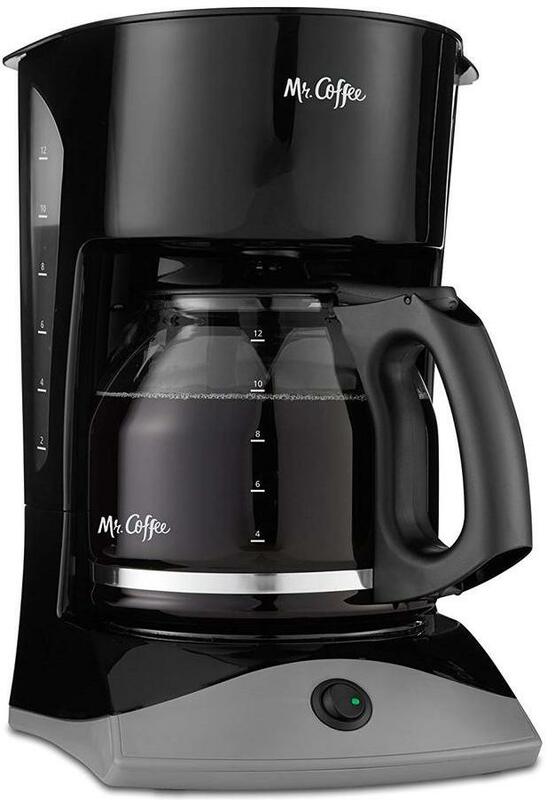 Being made by a respected manufacturer, the coffee maker is also known for its quality. Users don’t need to worry about dripping. A water level indicator is also added together with an auto shut-off function. Users can also rest assured knowing their machine is covered by warranty for up to 2 years. Resembling premium coffee makers by its features, the Thermal Coffeemaker is recommended for hot coffee available through the day. Why we like it: Available with a glass carafe, the coffee maker is known for its speedy results. Made with a few simple controls, the coffee maker is a top choice from the respected manufacturer. 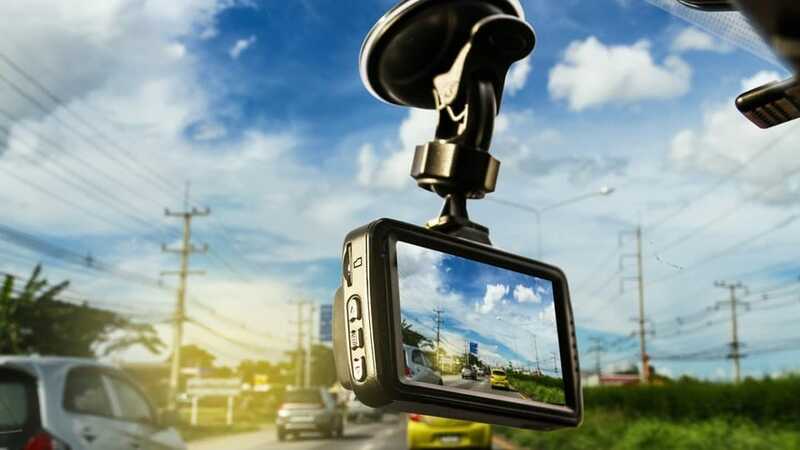 It has the potential for those who need a simple alternative with a few great features. In order to start the brewing process, water needs to be poured into its container. Coffee is then added according to the preferences of each individual. With the help of a glass carafe, the coffee can also be heated and maintained hot through the day. 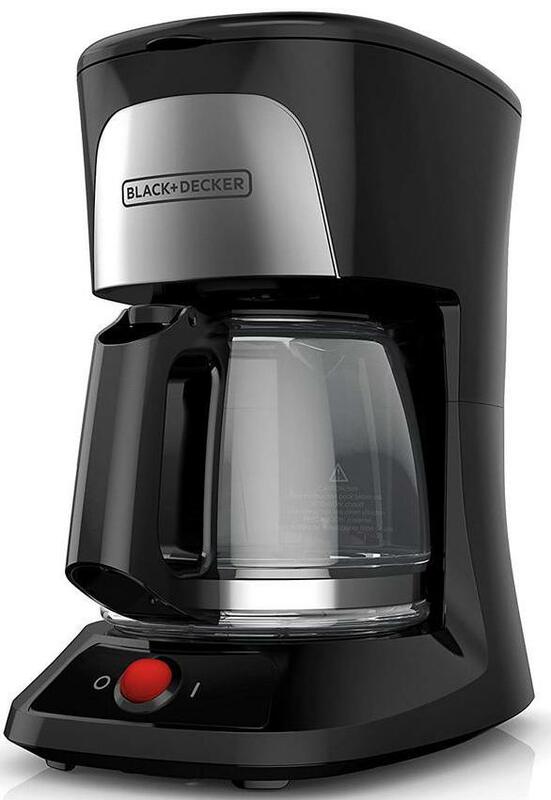 One of the most important features Black + Decker offers is the coffee strength selector. Apart from this popular feature, coffee drinkers can also rely on the perfect coffee temperature for each cup. Brewing technique can be different according to the type of coffee. But a regular cup measures around 5oz. Cleaning the coffee maker is not complicated. The removable brewing basket can be added to the dishwasher. Cleaning the carafe on the inside is made with a mix of water and vinegar which are then left for up to 30 minutes to remove any residues. Electrically, the coffee maker does not need any special requirements. It connects to standard 120V voltage. At a weight of just 2.3 pounds, it is also easy to move next to a plug for those who may need better practicality around the kitchen. Of course, being one of the most affordable designs in its class, it also lacks a few characteristics. The most important missing characteristic is the automatic brewing with a timer. For those who want a reliable design even without a preset timer, the coffee maker can come with delicious coffee every day. Coffee lovers willing to spend more actually have the opportunity of working with their own machines packed with functions, similar to those used by baristas. Most importantly, the following coffee makers are ready to be handled even by novices. 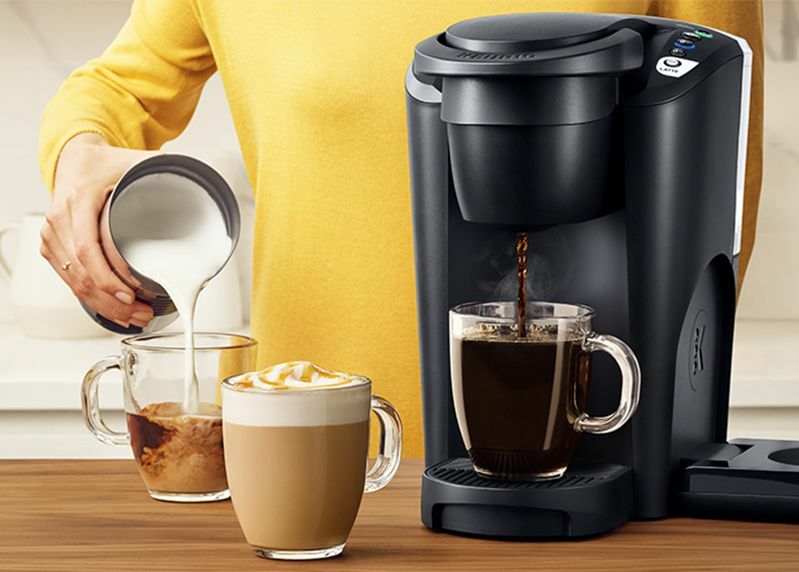 Why we like it: With a 2-in-1 design, the coffee maker is a top choice for the ultimate versatility for home use or for fresh coffee at the office. The coffee maker is really combining two machines into one. On the left side, it gives users the ability to make coffee with a standard carafe and coffee added in a brew basket. On its ride side, it allows users to make a single cup of coffee, based on pods capsules. 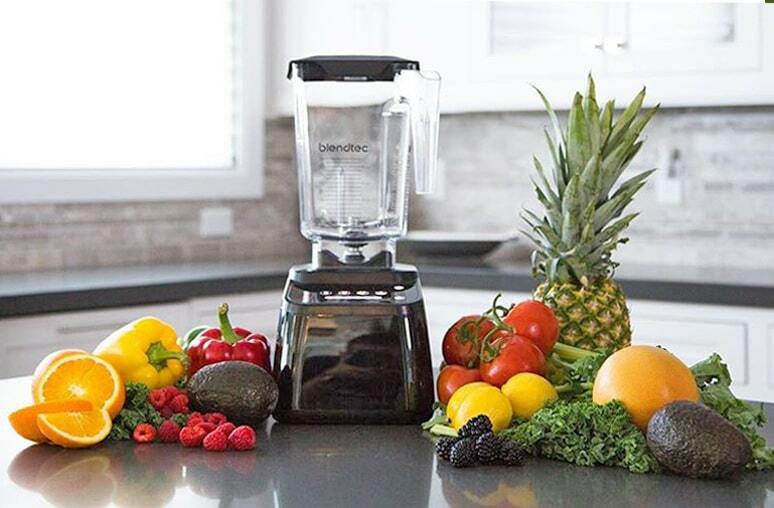 Among its other design characteristics, Hamilton beach has also added the ability to use the machine with extra flexibility. The mug holder can be adjusted in height to allow the use of different mugs. The carafe brewing section is also easy to use. It comes with large controls which are very easy to use. Those who haven’t used a coffee maker before can make the most of the design. It comes with everything expected by coffee lovers. It even has a timer function to have coffee ready in the morning or when getting home. A brew strength selector is also appreciated by many coffee enthusiasts. It is why it allows one of the best solutions when it comes to a tailored taste. This might not be as easy to achieve with the pod capsules. Apart from these advanced characteristics, the coffee maker is also equipped with a digital clock. One of the strengths of the clock and of the digital display is the angle construction. This used to be a problem for all users who had difficulties reading the display at times with other coffee makers. Another important feature comes with auto-pause. This allows users to pause coffee making. It also immediately shuts-off the water flow, resulting in no dripping. But the coffee maker also goes further when it comes to proper safety. A 2-hour auto shut-off programming feature has been added for this purpose. The good news is that most of the plastic parts of the coffee maker can be washed as well. The pod-piercing assembly can be completely removed and washer. This avoids clogging, which happens with frequent use. Of course, such a machine might not come with as many imperfections as many would believe. One of the issues some coffee lovers have with it is the fact that it won’t keep coffee hot for the entire duration of the day. 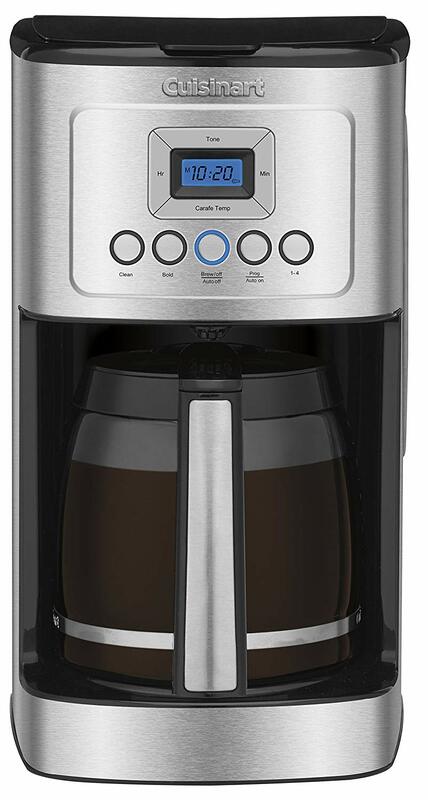 With a complex design, the coffee maker is perfect for office use where it makes multiple cups of coffee or it can be used with its pod capsules. Why we like it: The coffee maker is among the top options for those who want to have coffee ready for up to 4 hours after brewing is done. 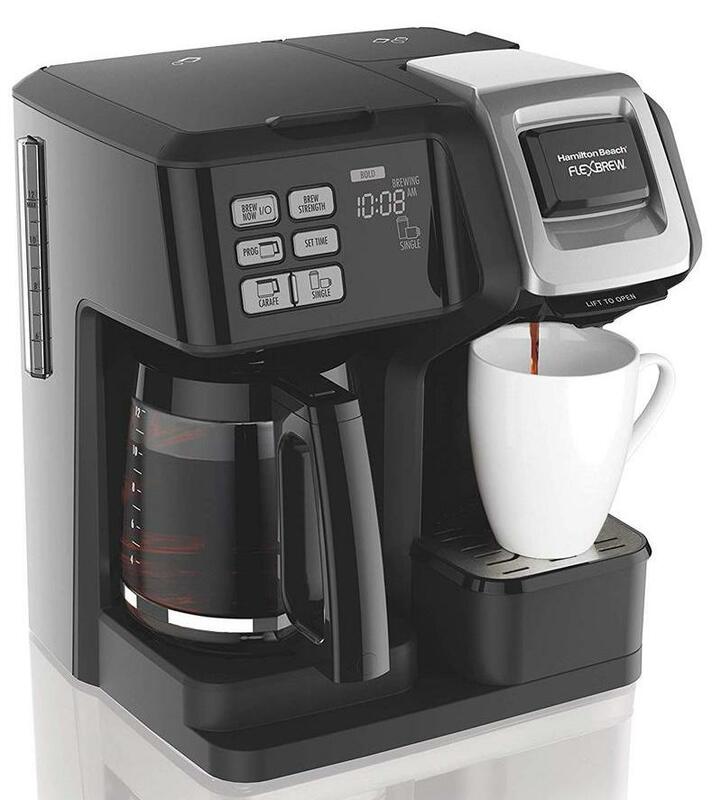 Made with top features, the coffee maker is appreciated by many enthusiasts. With a filter which can be used multiple times, it represents a solution which works in all environments. Those drinking coffee at home can rely on it for a hot coffee early in the morning with its programmable functions. The money spent on paper filters is saved as well. Those using the coffee maker at the office might consider it its carafe design which is ready to offer a cup of coffee for up to 12 coworkers. The design of the coffee maker also comes with thermal flavor extraction. Having the water ready at the right temperature is crucial for a rich flavor. Furthermore, the design of the machine also allows it to keep the coffee at the right temperature for up to 4 hours before automatic shut-off. One of the most convenient features comes with the removable water tank. It can use water directly from the tap with no other mugs needed to fill it in. But the machine can also deliver different types of coffee. A small batch can be made with maximum flavor intensity. A full carafe can be made for all family members or coworkers. A classic rich taste is also a great alternative with up to two cups of intense coffee. A programming function is available as well. It allows coffee lovers to choose delayed brewing. This can be set in advance with up to 24 hours. Together with brewing pause functions, it allows the coffee maker to be one of the most versatile choices for such a low price. Even more, it also comes with original features which make it stand out for many potential buyers. For example, its carafe is designed with a flavor straw. The role of this straw is to actually ensure each cup of coffee is full of flavor. 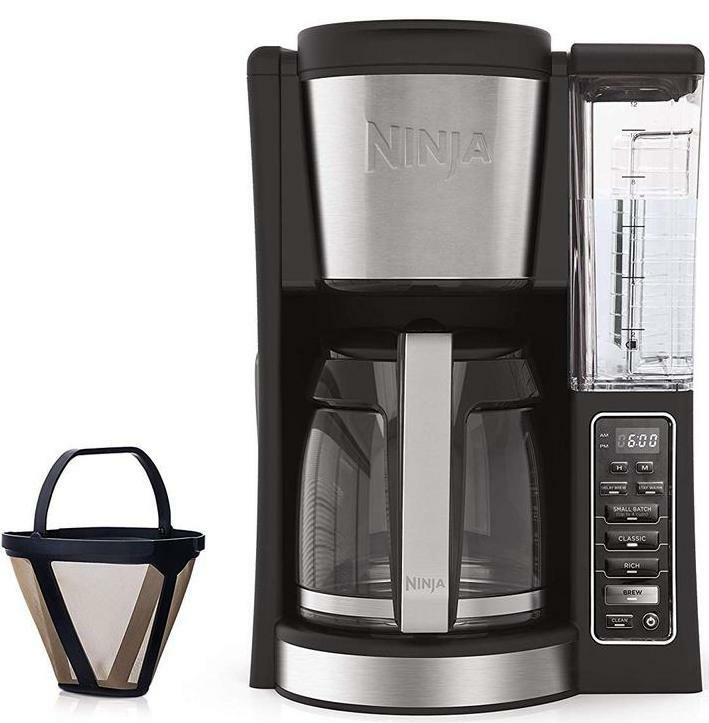 As one of the practical coffee makers, Ninja’s design is a great addition to other Ninja kitchen equipment. Why we like it: With one of the most appealing affordable designs, the Cuisinart DCC 3200 is a top addition to any kitchen. With a design which makes the coffee machine looks like a premium release, it is no wonder so many people are already using it. It comes with a stylish metallic finish and elegant buttons to controls all of its functions. With a large carafe, the coffee maker can handle even multiple coffees at a time. The coffee maker is also designed with a clean function. It is used on a regular basis to keep the machine clear of impurities. At the same time, it also comes with a gold tone filter which can be washed as well. Making hot coffee is one of the priorities of the machine. The best part is that this result is achieved without compromising the flavor profile. In fact, the coffee machine comes with strength control functionality. It represents one of the best ways to keep an eye on the actual taste. Strong and mild aromas are achieved by controlling coffee quantity and water flow. Of course, the coffee maker can also keep the coffee hot for longer. The actual coffee in the carafe can remain hot for a few hours. It cannot remain hot for the entire day due to safety purposes as the machine will automatically switch off after 4 hours. Brew pause functionality is in use as well. It allows all coffee lovers to stop a long brewing process for multiple cups of coffee to get their cup full immediately. However, one of the inconveniences to consider comes with the lid design. It is actually where the lid can create problems as it doesn’t fully open. So pouring water into the water container needs to be followed with proper attention. As one of the elegant affordable designs, the coffee maker is a valid choice for the aesthetics-conscious user. Why we like it: With a modern design, the pod-based coffee maker can be a choice for those seeking simplicity. Made with one of the most modern designs in its class, the coffee maker is ready to complete any kitchen counter. It has a distinct look mainly due to its pod-based brewing process, which allows the manufacturer to eliminate a few areas of the coffee maker, such as the mobile brew basket. On top of the coffee maker, users are able to see a few signaling lights which are used to indicate certain needs. For example, when water is needed, its corresponding light is switched on. When the time comes for descaling, users are also prompted to make the most out of the machine by keeping it in good working condition. It takes less than 1 minute to brew three cups of coffee. From the perspective of time, it is doesn’t require users to wait too much before enjoying their fresh coffee. Of course, this could be even faster, but the manufacturer has based the machine on an energy-saving approach. Descaling functionality can also be considered as one of the top functions to improve durability. Reducing calcium build up is a must-do on a regular basis. The coffee maker also comes with auto switch-off functionality. But maybe most importantly, users need to know that the adjustable mug tray allows them to use various recipients from cups to travel mugs. A 48oz water reservoir can serve these needs. Based on modern design and offering 3 cups of coffee within one minute, the machine is a speedy solution for fresh coffee. Why we like it: As one of the straightforward brewing experiences, the machine offers simplicity with plenty of great features. The design of the coffee maker is its main strength. It manages to pass over drawbacks coffee makers come with. For example, it has a lid which opens at 90 degrees which means adding coffee and water is very easy, even when there is not too much room in the kitchen. The controls’ layout is top class as well. All controls are placed in a logical order and in a straight line. Brewing a perfect cup of coffee is not impossible as a result. Many users find Braun’s design to be actually superior to what Cuisinart has to offer. With a capacity of up to 12 cups of coffee per carafe, there are reasons to believe more can be achieved with this elegant design. The first button from the left side of the control panel serves for immediate coffee brewing. The second button is also dedicated to brewing, but with an included timer function. Auto-off and clock buttons are also placed on the coffee maker. Cleaning is also easy as all that needs to be done is to press the dedicated program and to add a combination of water and vinegar. Brewing a smaller pot of coffee is also possible by selecting the right option from the 1-4 dedicated button. Based on a unique simplicity and a premium design, Braun’s coffee maker might just be one of the most underrated designs in its class. How many times per day can I use a coffee maker? A coffee maker can be used multiple times per day. At the same time, a few products have the ability to make multiple cups of coffee and keep them hot through the day. Is my coffee going to be cold? Brewing temperature differs from product to product. Please ensure you read the product’s description for brewing temperature before making a purchase. Can I use a cheap coffee maker at the office? Cheap coffee makers can be reliable. Furthermore, if they are able to make multiple cups of coffee, they can be used for large families or at the office. Is it safe to leave the coffee maker on while away from home? Each product has its own recommendations. Some coffee makers use a hot plate to keep the carafe and the coffee inside at a high temperature. Given no immediate fire hazards are located next to the coffee machine, it can work even when you are not at home. However, it is best to fully read the safety precautions of the coffee maker before leaving it unattended. The auto shut-off function can protect all essential components of a coffee maker. Choosing the best cheap coffee maker is often a struggle between low-quality products and designs which are slightly above budget. However, times have changed and manufacturers are starting to offer quality products at a lower price. The number of cups of coffee which are brewed at a time is an indication of how much a coffee maker will be used through the day. Drinking just one coffee seems to be a rarity and it is why users can save coffee and even have a reduced impact on the environment by brewing more coffee at a time. Adding water doesn’t sound complicated. But when the top lid doesn’t fully open, it can be a problem, especially when the coffee maker is situated in a hard-to-reach position. The lid can open at 90 degrees or more with some coffee makers. Some advanced features can be seen even on cheap coffee makers. They include delayed brewing, auto shut-off or coffee intensity. The delayed brewing function allows users to simply have their coffee ready when they wake up. 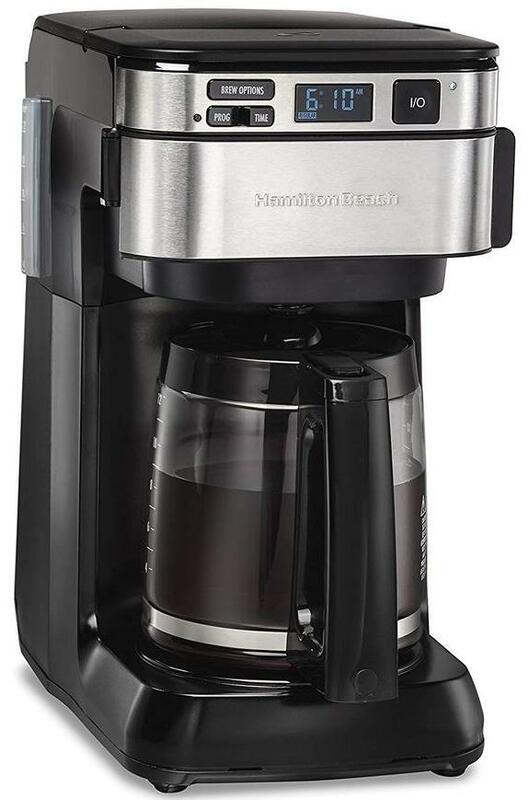 The auto shut-off function is made to offer the coffee maker a break after a few hours of keeping the coffee hot. A coffee intensity selector can also go a long way when it comes to specific taste preferences. The brewing temperature is not constant in all coffee makers. Many manufacturers stay away from hot temperatures as they can take away from the coffee flavor. However, many users prefer their coffee drinks to be hot. A good balance needs to be kept from this perspective. Cleaning the coffee maker used to be complicated. Various parts used to get clogged and cleaning them used to take a lot of time. Cleaning the coffee maker’s mechanism is not easier with the integrated cleaning functions. Some of the best coffee makers already include this function. Removing parts such as they brew basket for manual cleaning is also recommended. A few of the best coffee machines also come with automatic notifications for the cleaning process. When it comes to some of the most durable materials used to make the coffee machines, users might be surprised to find out they can actually be washed in the dishwasher. It is why there is a new trend most manufacturers follow. Offering simple maintenance is now mandatory for the best products. Going even further and recommending cleaning solutions such as a combination of water and vinegar can also be the case with some manufacturers. All of these steps are usually followed in order to remove calcification. The best cheap coffee maker is all that’s needed at times. Without spending thousands of dollars, users can find better results even when on a budget. They key is to look for a future-proof product. Good durability and a selection of important features are the roots of the process. It is why coffee lovers should always strive to purchase the best coffee maker, even within a low budget. Apart from a great coffee maker, good coffee is important as well. It is always recommended to use fresh coffee to maintain its flavor profile. At the same time, using coffee in bulk can come with considerable savings. The good news is that even pod machines can use this type of coffee. Furthermore, users can create their own flavor profiles by adjusting coffee intensity. This is made automatically by an advanced dedicated function found in the best coffee makers. Since coffee is drunk every day, it is also important to keep the coffee maker clean for the best results. All products come with an owner’s manual which goes into detail on how this is achieved. Although not many people read these instructions, it is worth considering the best practices and what the manufacturer has to say about cleaning the piercing needle or about changing filters.